Lovely. I’ve long considered your site a favorite. The subtle coloring and the sign going off into the distance are great. You certainly don’t disappoint. That is an absolutely fabulous shot. It’s amazing how such beautiful flowers will grow in the most inhospitable places! the magic of the unexpected, tomo.. i love the pov here, and i’m sure that passersby wondered what on earth you were doing! 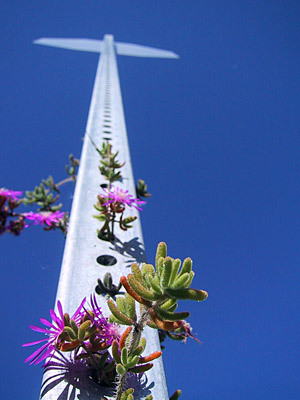 The persepctive is wonderful, and I love the flowers coming out of the pole. You have an incredible eye! what’s up with not being able to comment on older images, or at least state somewhere that you can’t. i thought it was faulty navigation or something. this is a very cool image though. love the detail and rich colors in the flowers, and amazing perspective and distortion of scale. thank you all. :)えいこ » こちらこそ、いつもありがとーです。励みになっております。:)Chou » またしばらくしたら見に行ってきまーす。どこまでのびるかなぁ。ふふ。Pal » this is with my poor/old powershot s100. ;)lynn » yes, they “stopped” to see what i was doing… :Dzerosun » sorry for the incovenience. due to massive comment spams, i had to close it.